Interesting... very interesting. After a mob of people from our Facebook group went out just yesterday (Sunday) to conduct a test run of the Translink card on San Francisco Muni vehicles and stations, the local media releases word that BART will be on the Translink program in early June. The MTC reports that BART should have their software updgrades to the gates installed by May 5th and will conduct approximately 30 days of testing (as claimed by BART PR man Lynton Johnson). BART claims they will have approximately 1,000 people from their EZ Rider pool in their "slow rollout." If BART is ready to go within 30 days, this means that it should be ready for public use in very early June of this year! Translink cardholders rejoice! We now have a new option to get around the Bay Area, and now we can truly connect Muni, AC Transit, Golden Gate Transit (w/service that goes to El Cerrito Del Norte BART), and BART as one big program. Will BART ticket machines be capable to add e-cash on Translink cards? Will BART in-person ticket vendors have Translink add funds machines so us Commuter Check folks can claim our checks without visiting the AC Transit ticket office? Will BART be using a separate e-cash "purse" since they offer a 6.25 percent discount for the "high value" tickets they regularly sell now? If Muni passholders use BART, say from Balboa Park (SF) to North Berkeley, will the pass be allowed and only be charged the segment from West Oakland (first non-SF stop) to North Berkeley? Or will passengers have to get off at Embarcadero to tag-off, and re-enter the system to save money? Will BART issue the e-transfers for the discount rides for the other Translink connected agencies? AC Transit for 25 cent discount, VTA bus (via Fremont station) for unknown discount, Muni for 25 cent discount to/from, and free ride on Muni (28, 28L, and 54) to/from Daly City? The article in the Chronicle is not too clear. Will BART have full-rollout of Translink after 30 (or so) days after the test run on May 5th? 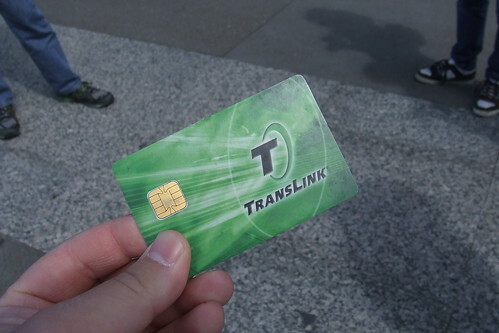 Why are you still selling EZ Rider cards when Translink will take-over this process? Next up???? Caltrain??? Rumor has it they will be doing a tag-on/tag-off system where if you tag your card at the station, you are charged the maximum fare. Once you exit the system, you tag-off to be charged the appropriate amount depending on the zones you traveled. They may also be considering an "unfortunate incident" option where if your train is delayed (especially due to the number of suicides and accidents), you can tag-off at the same station you tagged-in and get a full refund. Lastly: SF Appeal published an article about the Translink group trip on Muni! Thanks to writer and photographer Matt Baume and editor Eve Batey! Does San Francisco Need a Special Election?